Madeline Virginia Crump Smith began her life's journey in the small village of Rossville, MD on Saturday, December 20, 1919. She was the third child and only girl of Israel and Sadie Virginia Crump. Madeline, aka Madge, Aunt Sis, Sis, as well as Auntie, was raised and nurtured in the Muirkirk/Rossville community, living there her entire life. Educated in the schools of Prince George's County, she received her primary education at the historic Rosenwald School-Muirkirk Colored School No. 2, and later attended the Lakeland Community High School in College Park, MD. On Saturday, February 22, 1947, Madeline was united in marriage to the late George Edward Smith. Their marriage survived over fifty years. From this beautiful and happy union, came their only child, Pamela Smith-Oliphant. Her spiritual journey began at Queen's Chapel Methodist Church, and at the age of seventeen, she joined Queen's Chapel. 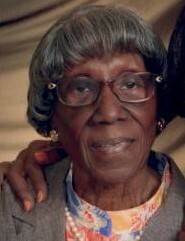 Madeline was a charter member of the Queen's Chapel's Young Adult Fellowship organized in 1948. She took great pride in the organization's work towards the construction of the new brick edifice. They sponsored many creative fundraising projects as well as singing the songs of Zion on the third Sunday of each month. The group particularly enjoyed accompanying the charismatic Rev. Joseph F. Haskins on preaching engagements. From the time she joined Queen's Chapel, Madge was a faithful and steadfast member attending services until her recent fall in March of this year. As the Young Adults transitioned into the Adult Fellowship, Madeline and the group continued to contribute to the life of the church for over twenty-five years, raising funds for needed church projects, overseeing Annual Homecoming, as well as decorating the church at Christ­ mas time. The group also sponsored numerous traveling excursions led by the late Bro. Charles Matthews, Sr. and the late Sis. Alice Gibson. Madeline was also a member of the church's Usher Board, and it is hard to forget the stiff white uniforms and beautiful white handkerchiefs those ladies wore on the Sundays they served. Married to a veteran of World War II, Madeline was also an active dedicated member of the William F. Smith, Post #235 Women's Auxiliary. When a Victory Club was organized after World War II by young women from the Vansville segment of the community, Madeline became a member. Like many of the community's young women, Madeline's first work experience was that of a domes­ tic housekeeper in Riverdale, MD. Again like many of her generation, Madeline was an excellent seamstress. During World War II Madeline was employed by the U.S. Army Quartermaster making uniforms for our troops, one of whom was her future husband George. After the war, she worked for a time at the Log Lodge Cafeteria located on the Department of Agriculture's Government Farm in Beltsville. Madeline obtained employment in a biology lab for the Meat Inspection Division at the Government Farm and retired after thirty years. Even though she lived her entire life in Rossville, Madeline loved traveling, and in addition to traveling with the Adult Fellow­ ship, she also traveled to Nassau, Bahamas, Bamberg, Germany to visit her daughter Pam, Myrtle Beach, South Carolina and many other vacation spots. She also loved cooking, especially for family and friends. She was known for her blueberry pudding cake and her date nut bars, both of which were always a big hit. To Madeline, the family was everything, and it always gave her great joy, particularly for the annual picnics held at her home, but basically, she just loved having them around. She and her sister-in-law, the late Keziah Brewer, would cook for a week in preparation of this event. Crocheting was also one of her passions. She loved crocheting doilies, hats and especially afghans. She made countless recipients extremely happy, as they too were added to the ranks of recipients who were gifted with one of her afghans. Finally, for those of us who grew up with Madeline and the other women of her generation - Dorless Crump, Eleanora Payne, Mattie Thomas, just to name a few - they were our fashion divas. While we might try to emulate these women, many of whom nurtured our next generation, unfortunately, we fall short somehow. Madeline loved to shop. Over the last several years Madeline experienced challenging health issues. On April 8, 2019, she quietly and peacefully slipped away at her home in Rossville. She leaves to cherish their memories of the life they shared are her beloved daughter, Pamela Smith-Oliphant; four godchildren, Joycelene Turner, Ronald Crump (Barbara) and Mona Crump-Sisco (Sam); one of her god-daughters, Maria Green preceded her death; special friends, Phyllis Hopkins, Margaret Gross, Evelyn Matthews, Gregory and Delila Parham, and Maxine Still, as well as a host of nieces, nephews, great-nephews and nieces, great-great-nephews and nieces; and great-great-great nephews, as well as a host of other loving family and friends. Where I have gone I am not so small. My soul is as wide as th e world i s tall. I have gone to answer the call, the call Of the One who takes care of us all. Wherever you look, you will find me there­ In the heart of a rose, In the heart of a prayer. On butterflies' wings, on wings of my own, To you, I' m gone, Bu t I' m never alone- I am home.